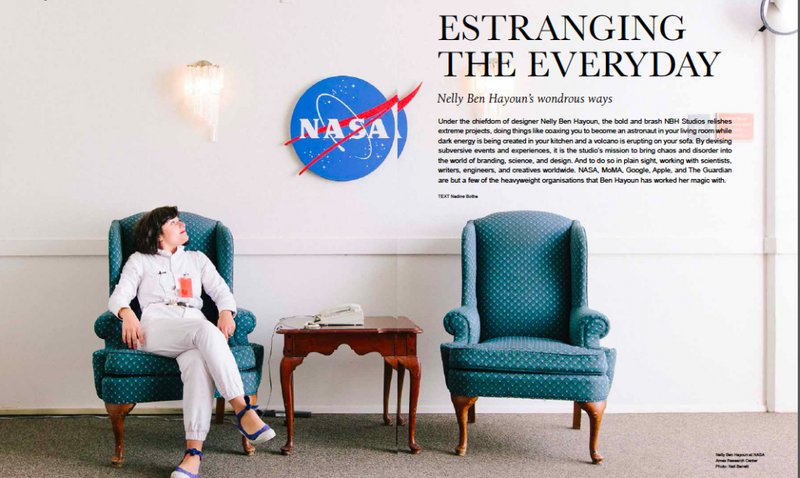 Designer Nelly Ben Hayoun relishes extreme projects, doing things like coaxing you to become an astronaut in your living room while dark energy is being created in your kitchen, and a volcano is erupting on your sofa. By devising subversive events and experiences, it is her mission to bring chaos and disorder into the world of branding, science and design. Designer Nelly Ben Hayoun is such an event. With her bustling energy barely zipping into her astronaut suit, her beguiling French brogue and self-described “tiger eyes”, she has pushed her way into the nonparaeil conservatories of science such as the NASA Ames Research Center and the SETI Institute in the United States, the Super Kamiokande neutrino collider in Japan and the Large Hadron Collider in Switzerland. The results have been unprecedented. Who would ever have dreamt up pooling the amateur musical talents of scientists to put together the International Space Orchestra that not only retells the story of the 1969 moon landing, but plays alongside Damon Albarn and Beck, records the opera in George Lucas’s Skywalker Ranch where Star Wars was shot, and releases the recordings into space to orbit the earth on board the International Space Station. Never mind who, to what purpose? Besides being an event in herself, Ben Hayoun also designs events that allow the public to experience the world of science. These include Super K Sonic BOOOOum in which the audience donned helmets, white rubber shoes and boiler suits before being rowed in dinghies through a water and balloon-filled installation that simulates the Japanese neutrino observatory. After being addressed by a Nobel Prize-winning physicist, a light and sound show emulating a neutrino collision is witnessed. In a similar vein, the Soyuz Chair simulates what it feels like to lift off in the Soyuz Rocket. With her The Other Volcano project, Ben Hayoun worked with a volcanologist and pyrotechnic designer to create a domestic appliance that would randomly go off, just as a volcano would, but in one’s own home. She advertised for volunteers who would live with the volcano. “Obviously we are not giving you a volcano as it’s filled with gunpowder, but let’s engage you in a debate of why you want to risk your life! ?”exclaims Ben Hayoun. “I prefer the process of accessing the impossible than to actually seeing it happening,” she goes on. One might say she is designing our imaginations then, and she does constantly refer back to the big influence that Antonin Artaud’s theatre of cruelty has on her work. The theatre of cruelty is based on the principle of viscerally overwhelming audiences’ senses in order to evoke an unmediated response directly from their subconscious. “And I get quite violent with them,” Ben Hayoun points to the Super K Sonic BOOOOum. Inspired by Jean Paul Sartre’s book No Exit, The Other Volcano is also about domestic mundaneness that leads to existential disinterest. In Žižekian terms, the volcano is an event used to disrupt the everyday life, create a near death experience and embody thy self again. Ben Hayoun loves her French philosophers, however, and it is armed with Jean Baudrillard that she goes in search of the reality behind our Hollywood-constructed hyperreality of doomsday in her latest project, Disaster Playground. By exploring the 20-people long chain of command between the first sighting of an asteroid attack and the decision to act, it becomes apparent that it’s nothing like Bruce Willis with a drill or the president with a big red button in their drawer. In fact, it’s rather ordinary and everyday things could go wrong, such as someone not having their cellphone on them. A multi-platform initiative that includes a book, an app, a video series, an exhibition and an experience, it is through the Netflix-distributed film that it is most widely known. “I engineer situations by looking at systems, how I can design and modify them, how I can engineer for social actions,” Ben Hayoun responds to whether she is increasingly becoming more of a film director than designer. For instance, she explains that the giant red telephone and plastic dinosaur prop in the film are based on Bertoldt’s Brecht’s epic theatre, designed to create an imaginary estrangement and reintroduce wonder into the everyday. This “empowers intelligent agents” to see the artificiality of the disaster system and “render it visible”, she explains. Ben Hayoun’s work is as far removed from the luxury chair and lifestyle industry of the Milan Design Week as one gets. In fact, the last time she was there was in 2012, performing “A Milanese Foley” in which she used the craft techniques of Foley Artists, sound film artists, to perform the sound of sitting on a Barcelona chair, typing on a Valentino typewriter and so on. “It wasn’t easy,” Ben Hayoun confesses that people didn’t understand what she was doing, and even the London Design Museum turned down her residency proposal. Four years later and the overriding trend of Milan Design Week 2016, according to Het Nieuwe Institute in Rotterdam, is performance becoming recognized as a medium of design. Yes, this little pioneer is an event with unforeseen consequences. It’s first thing on Monday morning. We’re sitting in Shoreditch House in London. Ben Hayoun has barely gulped down her earl grey tea and butter-and-jam bread, but she’s got a plane to catch. Her next project is about outer space colonization and looking for new life forms, she says gathering her things. “And it’s got a Viking ship, but that’s all I can tell you,” she kisses both cheeks, and she’s gone.